For Lab Mice, The Medical Advances Keep Coming Before therapies are tested in people, they are often tested in mice. This year, scientists reported progress in melting away all sorts of tumors in mice, as well as promising treatments for a variety of other ailments. In a special series, we learn why the glass was half full for some people, places and products. 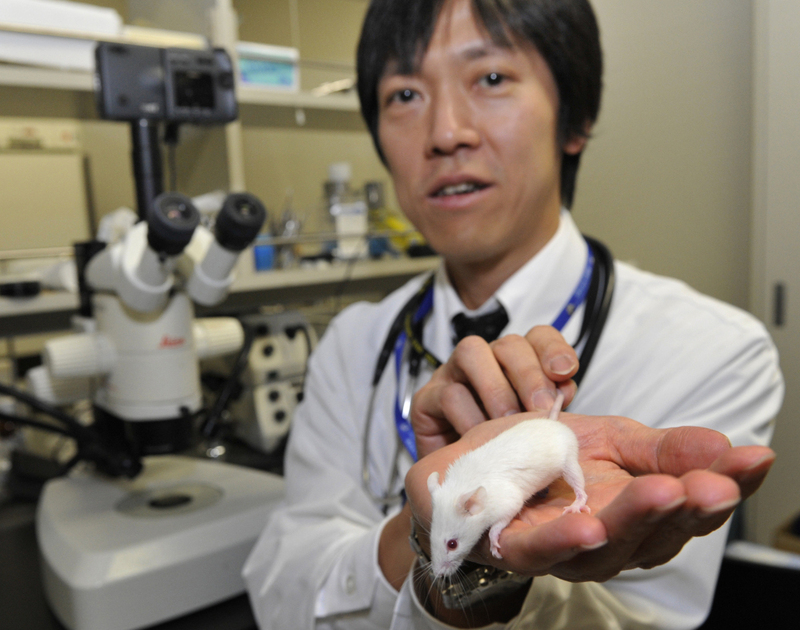 Takashi Yokoo, head of a project researching kidney regeneration at Tokyo's Jikei University School of Medicine, holds a mouse at his laboratory. When scientists want to test new therapies for cancer or heart disease, they frequently turn to mice for help. For most mice, this isn't the best thing that could happen to them. Being a research subject has definite disadvantages, at least for mice. But most people prefer a new therapy be tested in a rodent rather than making a human patient the guinea pig — if you'll forgive the twisted metaphor. So every year, mice get the latest therapies. And some of the time, they're cured. For example, Richard Vile, a researcher at Mayo Clinic in Rochester, Minn., works with a strain of lab mice that are prone to getting prostate cancer. "What we've done is we've vaccinated mice against tumors," he says. Vile says the vaccine is made from a special virus containing cancer cell genes. The modified virus energizes the mouse's immune system so it can fight off the cancer. The vaccine doesn't prevent cancer; instead, Vile gives the vaccine to mice that already have tumors. "In a proportion of the mice, in our best experiments, those tumors would actually go away," Vile says. "It is good news for mice." The good news doesn't end with prostate cancer. Scientists have reported progress this year in melting away all sorts of tumors, as well as promising treatments for a variety of other ailments. "How do we promote normal blood vessel regrowth?" she asks. "How do we prevent the abnormal new blood vessels from growing?" This year, she reported that giving mice omega-3 fatty acids — that stuff you find in fish oil — was an approach that shows promise. "It decreases by 50 percent the abnormal new blood vessel growth," she says. This approach only works before the problem develops. It won't be much help for the three blind mice we've all heard so much about. But just as some therapies are tested in mice before they are tested in humans, some are tested in mouse cells before they are tested in live mice. Jeffrey Holt, an otolaryngologist, also at Children's Hospital in Boston, has found some genes that have the wrong DNA sequence in people with an inherited form of deafness. So he's working with mice that have the same problem. "The idea is then to replace those genes with the correct DNA sequence and hopefully restore function," he says. This year, Holt was able to correct that problem in mouse cells. "That was done in vitro, in a dish. And now we want to do it in the live animal," he says. "We're pretty close. That's something we have planned for the next year or so." So for that good news, mice still have to wait a while.